Not completely happy with it. Ingame it has reflection and bump maps. Needs runes carved into the blade or something. Hm, I was actually going for a bleaker look. The blade is supposed to be made of bone. I think what really needs improvement is the shaft. Maybe make it a bit warped? That could work. I know I still have a lot of work to do on it. I like this thing. Vanilla's weapons are too short in my opinion, whilie this pole-axe has got right proportions. The shaft looks nice! The blade could probably be improved, I think. Edit: Ah, just read that it's made of bone. This explains the shape, probably. Here's what I put together for the Hist. I know it's (probably) too big, but what do you think of the design? Woah, that looks amazing. The nightmarish look and grappling roots are perfect for what I have in mind. Thanks! Also, big is good. I want the tree to fill up a whole interior after all. Excellent, here you go. Let me know of any collision issues (it happens). In case you hadn't thought of this already, you might want to hang some flora containers off of it that give alchemical ingredients players REALLY don't want to be eating, if you know what I mean. Thanks. It was one of those few models I've done where everything just... worked. I didn't go through 40 different redesigns, like usual. It came together just the way I wanted it to. I don't know if the Hist actually look like something you would find in an otherworldly swamp, but they're supposed to be extraterrestrials, possibly even from another universe, so it made sense to go that route. 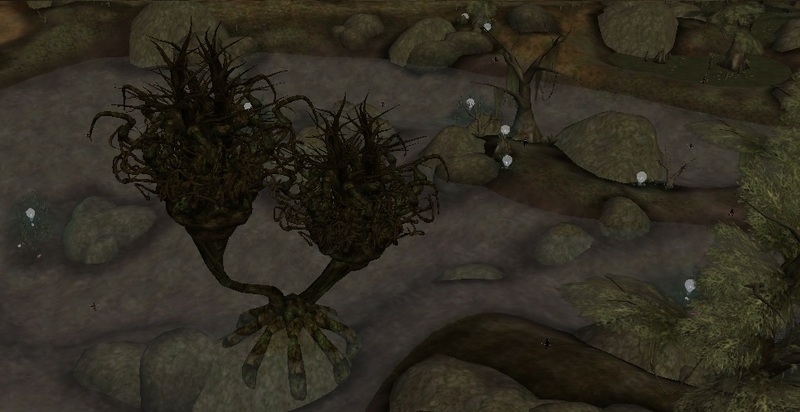 I know that the Blackwood Company in TES IV have a Hist tree, but I avoided looking at it when I made mine, as I didn't want that influencing me. Then when I did look at it, I saw that it wouldn't have anyway, since the Hist in OB looks like any other tree. Boooooooooooriiiiiiing. So, after a while I'm posting a bit of progress. Here are a few screenshots of the strange dream, a place where you "have to go" during a quest concerning the hist sap. Thanks to Autoclock for the beautiful hist model. You're welcome. Is there a reason the plant isn't being lit up? Also, please start posting these in the Gallery. The tree is very dark in itself, but this place simply isn't finished yet. Also, I am implementing a token system for my plot. For every quest you complete you get a sizable amount of tokens. You can also get a small amount of tokens for repeatable quests. These tokens are used to purchase certain rewards. Looks intriguing so far, Flash! And I like the token idea!